Drawing 2 shows a hall of three bays, with a lantern over two of the bays. The middle of the hall is top-lit by a segmental domed lantern with what appears to be a bell light in the center of the roof. The other lantern is smaller and is situated over the door to the Rotunda. The elevation is fractured into the upper and lower sections, with pencil additions to indicate capitals on the columns. The lantern is also altered in pencil, suggesting a lantern with a wider diamenter and a pitched roof. 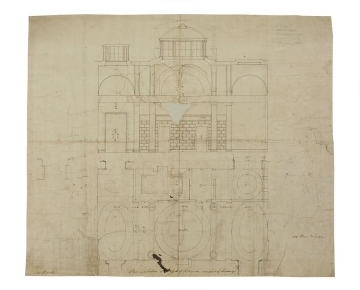 The plan in drawing 2 shows the two small offices beside the Vestibule. A note on drawing 2 reminds Soane that he is to see a Mr Amyand the next morning to view a house in Margaret Street near Cavendish Square. Dr Thomas Amyand was one of Soane's clients, and in 1791 Soane managed a lease for him, for a house on Duke Street off Piccadilly. The recorded date of this transaction agrees nicely with the assumed date of Drawing 2.